Compare Instant Hot Water Dispensers: InSinkErator or Waste King? If you wish to have near-boiling hot water at your fingertips for preparing quickly coffee, tea, hot chocolate, baby bottles and hot cereal or clean dirty pots and pans, blanch vegetables, prepare soup, etc., you might want to consider an instant hot water dispenser. No need to wait for the water to boil, no water waste, and no mess. ​Instant hot water dispensers save time and add elegance to the kitchen. They're usually made of an insulated udersink hot water tank connected to an elegant faucet installed on your countertop next to your sink. They are also equipped with an easily adjustable thermostat that allows you to select the temperature that suits you best. ​Here is how it works: Water comes up from your supply line into the hot water tank, where it’s heated. As the water is used, more water replaces it in the tank. With a fast recovery system, depending on the brand used, these systems can deliver anywhere from 50 to 100 cups of near-boiling water per hour. ​While the instant hot water dispensing faucet sits elegantly on your sink, the hot water tank sits unseen below it. They speed up the preparation of meals and hot beverages. Their low energy consumption saves money. They save water because there is no time wasted for the water to heat up. Various studies have shown that with an instant hot water dispenser used to provide near-boiling water can save up to 75% of the energy normally required to heat water to near-boiling temperature. This article will compare InSinkErator Involve H-Wave and Waste King (Anaheim) H711-U instant hot water dispensers. These were not just the most popular among Amazon customers at the time this article was written, but they had also received excellent reviews from most Amazon buyers. InSinkErator H-Wave can dispense up to 60 cups of hot water per hour. Waste King H711-U can dispense up to 100 cups of hot water per hour. InSinkErator Hwave dispenser's tank insulation meets UL 94HF-1 flammability specification. ​Though it may conform to UL 94HF-1, there is no such specification in the product description of Waste King H711-U dispenser. 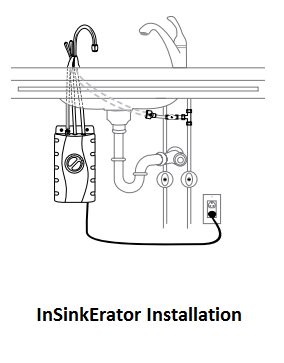 InSinkErator also makes the F-1000S filtration system designed for use with the InSinkErator hot water dispensers and that can be easily installed. When paired with the InSinkErator water tank, the F-1000S filtration system reduces particulates, chlorine taste and odor to ensure you have great tasting water. You can buy the F-1000S filtration system separately, and it is offered below in the Amazon products section. Waste King does not make a special undersink filtration system for hooking up to its hot water dispenser's tank, but you can always use the 3M Filtrete water filtration system offered below in the Amazon products section. InSinkErator H-Wave faucet is offered in either chrome or satin nickel finish. Waste King H711-U faucet is offered in satin nickel. InSinkErator dispenser comes with a 3-year parts and in-home service warranty. This warranty includes free house calls (including parts and labor) for the entire warranty period. Waste King dispenser comes with a 1-year replacement warranty. The Amazon prices shown were in effect at the time this article was written and may have changed. For exact prices, please refer to the Amazon products section below. Note that the Amazon price often includes a good discount to the list price. If a discount exists, both the Amazon price and the list price will be displayed when you click the Amazon product link images below. So which of the two instant hot water dispensers is best for you? The two instant hot water dispensers considered here are excellent products as shown by the average rating each of them had received from Amazon customers at the time this article was written. Indeed, InSinkErator had received 4.5 stars (out of 5 stars) and Waste King has received 4 stars. There is a good chance that you would be quite happy with either of the two instant hot water dispensers. InSinkErator can reach a higher water temperature (219°F vs. 190°F for the Waste King). 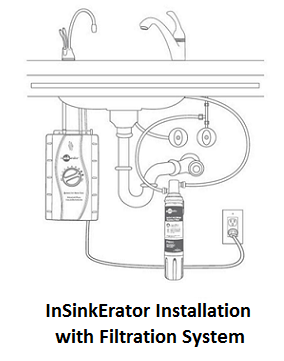 InSinkErator also makes the F-1000S filtration system designed for use with the InSinkErator hot water dispensers. InSinkErator's tank insulation meets UL 94HF-1 flammability specification. 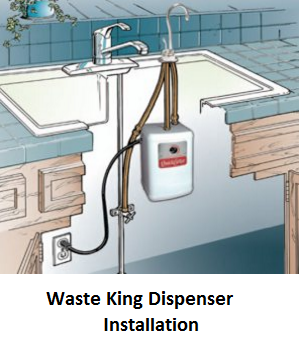 Though it may conform to UL 94HF-1, there is no such specification in the product description of Waste King H711-U dispenser. InSinkErator comes with a better warranty (3 years vs. 1 year for Waste King). On the other hand, Waste King dispenser claims to produce more cups of hot water per hour (100 cups/hour vs. 60 cups/hour for the InSinkErator). Though Waste King has a slighly smaller tank, this can be explained buy its more powerful heating system (1300W vs. 750W for the InSinkErator). Another point to consider, before making up your mind, is of course the price. Though the InSinkErator dispenser costs more than the Waste King, the above listed differences, in particular the extended warranty it comes with, makes it worth of serious consideration. Please click the instant hot water dispenser of your choice below for price information or to purchase. Note: If no price is shown on the Amazon link images below, the prices will be provided once you click the images. ​Are you rather looking for a countertop Instant Hot Water Dispenser?